The very last Electron Fuzz in a small enclosure! I’ve decided to discontinue this box. 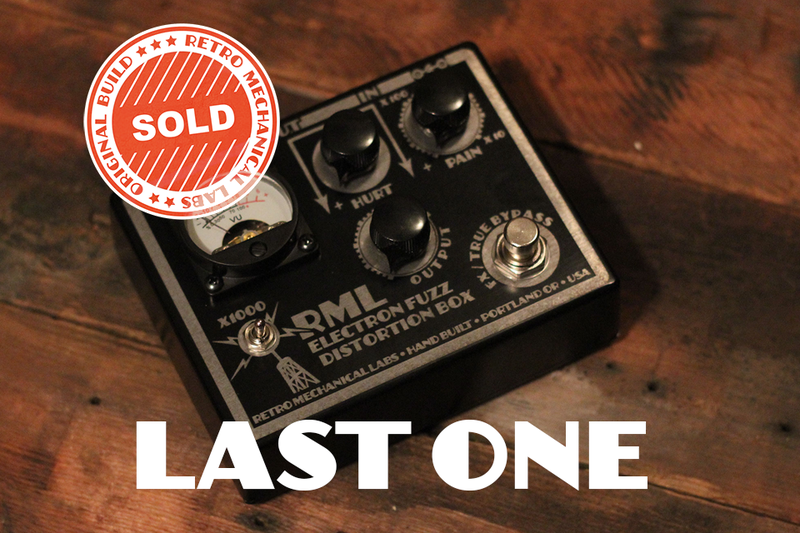 The Electron Fuzz Custom will still be available. I think the thing to do here is eventually make a version without the meter to reach a better price point. So this sadly is the last little Electron Fuzz with a small meter. The Electron Fuzz is an incredibly versatile distortion pedal. With 3 transistor stages of gain in normal mode, the Electron Fuzz delivers a warm, dirty and very crunchy sound to your pedal board. Want to really add a big bad sound? just flick the “X1000” switch for two extra transistor stages of gain (total of five!) and get even more dirty loud crunch. Ideal for the player looking to add some hard, dirty edge to their rhythm tone, this pedal sounds like your dirty, backwoods half cousin having a fist fight with a rusted barb-wire fence. In addition, the Electron Fuzz features our signature working meter that lights up and bounces as you play, letting you know just how much gritty noise you are pumping out on stage or in your garage. The Electron fuzz is available now in three colors, Copper, Silver Slate and Gold on a black enclosure. Comes with 12volt power supply. True Bypass. • Sound: Dark, dirty, crunchy distortion. Ranges from warm, fuzzy garage-band overdrive to a bright thrashy loud metal/industrial. Ideal for that heavy, dirty, growling southern metal sound. Think “Corrosion of Conformity.” or NIN “Ruiner” Guitar solo. Pain: Warm and fuzzy overdrive that builds in crunch as you dial in the pain! Hurt: Adds top end to the mix with more drive and crunch. This knob turns up the hurt with a brighter and tighter crunch. Output:Volume/saturation. Take some of the edge off the mix or crank the pain and hurt all the way for a big, dirty, crunchy fuzz. • Switch controls: Truly X1000! This takes your sound through an addition 2 transistor gain stages and pushes the electrons way past 11! The booster switch adds a loud and dirty, thrash crunch to this versatile pedal. Incredible for feedback noise and FX textures. • Meter: Responds to your playing, and reflects first gain stage transistor distortion.